Welcome to my latest project entitled “Friday Flashback” that takes a look back at the pics, stats and reports (in many cases) from the fishing hole. Similar to the “Trapping Tuesday” postings that ran during trapping season, this one will look back 5, 10, 15…30 years at memories from time well spent on the water. I guess all of these fishing logs, photo albums and blog entries actually come in handy. To kick off the series we visit a classic fishing hole known as Emstrom’s Pond located just west of Galesburg, IL. The name arose from the fellow who granted Dad permission to fish the spot back in 1988, Dwight Emstrom, who ran a local trucking company. It seems that his sister lived on/owned the land with the pond. 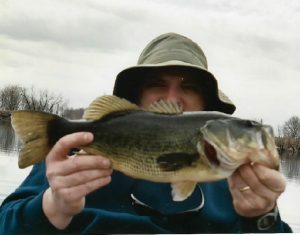 From 1988 through 2004, when we lost access to the pond, we caught a lot of fish including many pretty darn nice bass. Suffice to say, this won’t be the only visit we’ll pay to Emstrom’s Pond during Friday’s to come. My wife, Julie, always gave me a rough time about holding the fish in front of my face but what would you rather see? Today’s inaugural flashback features a catch from 15 years ago this week. 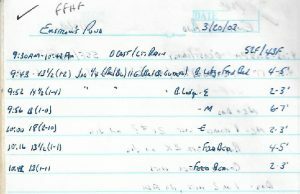 Below is an excerpt of the original report that featured the catch and was emailed to family and friends on April 5, 2003 in the days before I became an official blogger. Today’s bass came on the six bass day referenced above and preceded my standard Stat recap that is a feature in all of my latest fishing reports. So, better late than never.